A PID (proportional–integral–derivative) controller is a control loop feedback mechanism (controller) commonly used in industrial control systems. 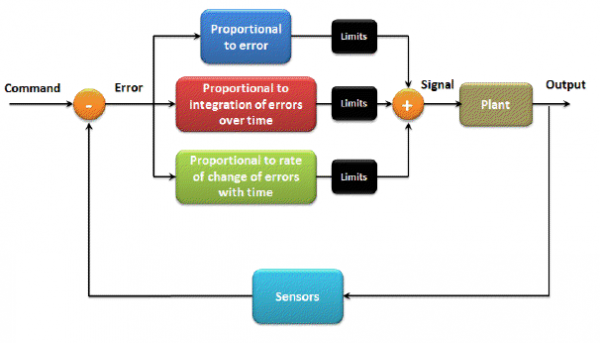 A PID controller continuously calculates an error value as the difference between a desired setpoint and a measured process variable. Tracking: input sensor is inside/outside, output plant is the left and right motor. Goal is to keep error (inside/outside state time) small. Motor speed: input sensor is odometry, output plant is the motor. Goal is to keep the error (setpoint rpm - actual rpm) small. error (P): Where you want to be vs. where you are - This is certainly a big factor. If you are at point A and your target is at point B, then the vector from A to B tells you a lot about how you need to steer, but it isn't the only factor. derivative (D): How fast you are approaching - If you are approaching the target quickly and you are close to it, you actually need to slow down. The derivative helps take that into consideration. integral (I): Alignment error - Your robot may not actually do exactly what you tell it to do. The integral helps determine how much you need to compensate for that. This page was last modified on 23 July 2016, at 12:38.